SAN JOSE — San Jose Taiko presents “Rhythm Spirit 2012: Taiko + Technology” at School of Arts & Culture at Mexican Heritage Plaza, 1700 Alum Rock Ave., San Jose, on Friday, Sept. 21, at 8 p.m. and Saturday, Sept. 22, at 2 and 8 p.m.
San Jose Taiko draws inspiration from the digital-driven Silicon Valley for new production. The company will be at an exciting new venue this year, and SJT will partner with the ZERO1 Biennial to explore the art form of taiko through collaboration with technologist/artists. The production can already be enjoyed by audiences as SJT shares the process through its social media channels. Behind-the-scenes glimpses are being posted on Facebook, Twitter, YouTube, Tumblr, and Soundcloud. Tickets are $25 for adults, $20 for students and seniors in advance, $30 and $25 at the door. Group rates are available. Buy online at http://taiko.org/rhythmspirit/ or call (408) 293-9344. This production is also supported by LiveSV, CreaTV, and the City of San Jose. Tuesday, Sept. 25, from 12 to 1 p.m., De Anza College Campus Center Patio Stage, 21250 Stevens Creek Blvd., Cupertino. Sunday, Sept. 30, from 2 to 2:45 p.m., Sunnyvale Public Library, 665 W. Olive Ave., Sunnyvale. Co-presented by Japanese American Museum of San Jose. Info: (408) 730-7300 or http://sunnyvale.ca.gov/Departments/SunnyvalePublicLibrary.aspx. Sunday, Oct. 14, at 3 p.m., Family Fun Series Concert, UC Santa Barbara, Campbell Hall, 552 University Rd., Santa Barbara. Info: (805) 893-3535 or https://artsandlectures.sa.ucsb.edu/Details.aspx?PerfNum=2448. Wednesday, Oct. 31, 5 to 6:30 p.m., Halloween in Japantown, Wesley United Methodist church, 566 N. 5th St., San Jose. Info: (408) 293-9344, www.taiko.org. Since 1973, San Jose Taiko SJT has been mesmerizing audiences with the powerful, spellbinding, and propulsive sounds of the taiko. 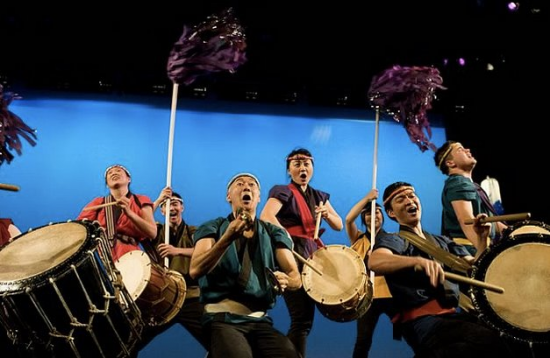 Inspired by traditional Japanese drumming, SJT performers express the beauty and harmony of the human spirit through the voice of the taiko as they strive to create new dimensions in Asian American movement and music. Continuing the core values of founding directors and National Endowment for the Arts 2011 National Heritage Fellows Roy and PJ Hirabayashi, SJT’s performance and expression are predicated upon a profound respect for each member of the group.